Irish People Most Likely To Say EU Membership Paid Off. 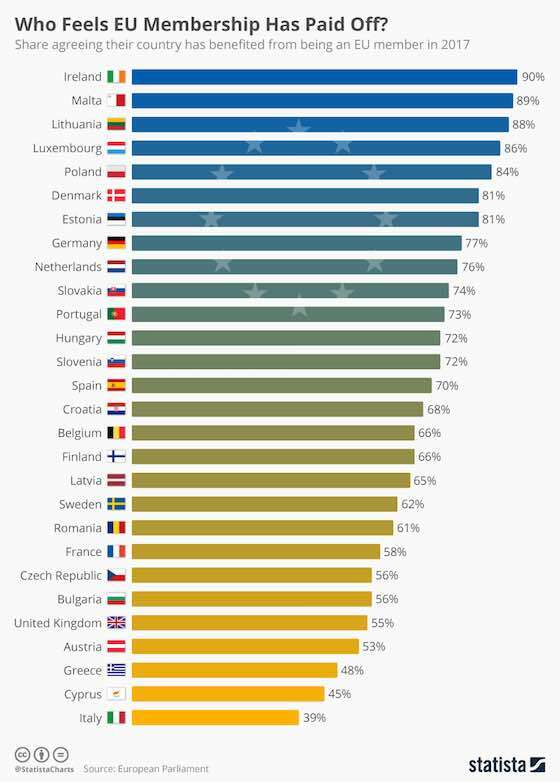 This chart shows the percentage of citizines agreeing that their country has benefitted from European Union membership. Amid the UK's Brexit vote and rising right-wing populism across Europe, euroscepticism has never posed a greater threat to the EU. Despite the turmoil, majorities in most countries feel they have benefited from EU membership. According to the European Parliament, 90 percent of people in Ireland feel their country's decision to join the EU has paid off. Back in 1973 before joining, Ireland was struggling to find its feet internationally amid strong economic dependence on the United Kingdom. In the years since it became an EU member, Ireland transformed its old antiquated and agriculture-centered economy into a modern one thriving on hi-tech industry. The European Commission has estimated that Ireland's net gain from EU budgets has amounted to an impressive €44.6 billion since 1976. Malta and Lithuania are close behind Ireland with 89 and 88 percent of people agreeing that EU membership has paid off for their countries. In Greece and Cyprus, people are far more pessimistic. 48 percent of Greeks and 45 percent of Cypriots feel they have not benefited from EU membership. Italy had the lowest level of agreement with only 39 percent feeling EU membership has paid off. Europe: "Who Feels EU Membership Has Paid Off?"